I’m what you would probably call a "casual coffee drinker." I’ll have a fufu coffee drink with a friend or on my own while working at a coffee shop. 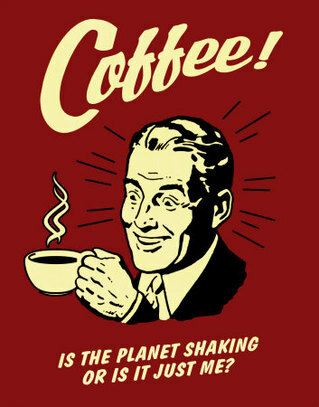 Unlike most of our staff, who on the other hand need to shoot coffee directly into their veins several times a day. That being the case, the amount of caffeine in espresso probably has a greater effect on my body. Which brings me to my point. I’m sitting here at Coffee Cat. I decided to venture away from my typical white chocolate mocha and get a mint white chocolate "cool cat." Yeah, I know, huge leap. There are 2 sizes of cool cats. I opted for the larger. Now, I feel like I seriously need to go run laps around the parking lot or I may spontaneously combust in my seat. I think my heart rate is up, my eyes are wide open, and I can’t stop shaking. I need to get out of my seat and move. But I HAVE to get this budget done today. Always get the smaller coffee!